Actuators are components that impose a force or torque on bodies, where the force or torque is given by a power port or input signal. Actuators have to be connected with bodies, just like joints. The position of the sensor is indicated by its connection point. 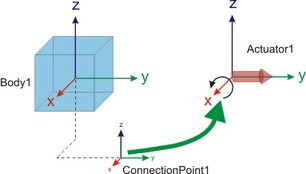 The connection point is shown automatically when you make a connection between a body and a sensor. First change to Connection mode ( ), then click the body and then click the sensor. The Create Connection dialog will pop to ask you for the location of the connection point. 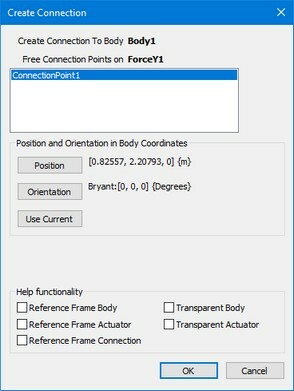 In the connection dialog you can set the offset (both the position as well as rotation) from the body reference frame to the connection point. For each actuator, you can change its settings, by double clicking it. 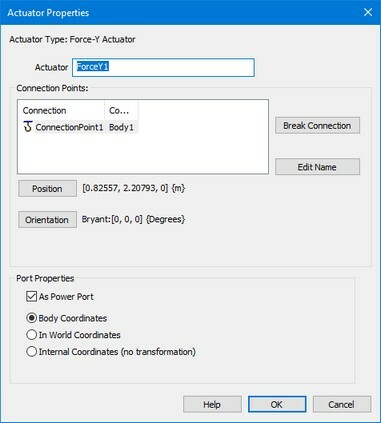 This will open the Actuator Properties dialog. In this diaolog you can change the connection point by clicking the position or orientation button. If you select the As Power Port option, the force or torque will be given by a power port, otherwise an input signal. By default the force or torque is defined in the local body coordinates. This means the force or torque will rotate and move with the body. 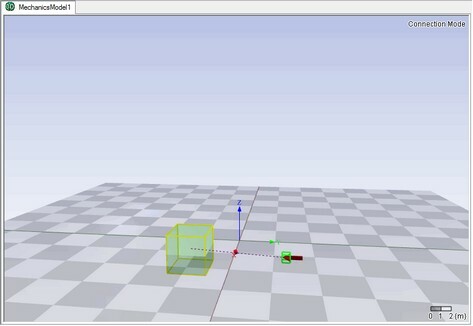 If you deselect the In Body Coordinates option, the force or torque will be in global coordinates and not rotate with the body. A torque in the x-direction of the body. A torque in the y-direction of the body. A torque in the z-direction of the body. A torque (size 3) in the x-, y- and z-direction of the body. A force in the x-direction of the body. A force in the y-direction of the body. A force in the z-direction of the body. A force (size 3) in the x-, y- and z-direction of the body. The combined torque and force (size 6) in all directions (known as a Wrench).